Engineers at Iowa State University have found a way to combine a genetically engineered strain of yeast and an electrocatalyst to efficiently convert sugar into a new type of nylon. Iowa could take a chunk of the nation’s $250 billion chemical market with greener replacements, but a state tax incentive is needed to help build the new industry, according to a report released Thursday. The state’s already established renewable energy sector makes it an ideal location for companies looking to manufacture bio-based chemicals, since they use some of the same processes and feedstock, such as corn, soybeans and crop residue, the report and experts say. “If you are not there at the nucleation, you can be left at the sideline and not be part of it,” Brent Shanks, one of the report’s authors, said during a news conference Thursday. “I think we want to do our due diligence to make sure what’s been proposed, No. 1, we can afford and, two, we can get some measurable results for Iowa taxpayers,” said state Sen. Joe Bolkcom, D-Iowa City and chair of the Senate Ways and Means Committee. A tax credit to support bio-based chemical manufacturing came before lawmakers last year. The Iowa House passed it, but it failed to get through the state Senate due to concerns over the program’s price tag. “We don’t have a specific number. We do know this industry is growing at a dramatic pace, that there are a limited number of states in this country which maintain adequate supplies of feedstock and Iowa is one of them, but that we’re not the only one,” Cultivation Corridor Executive Director Brent Willett said. The Iowa State professors also interviewed industry executives — including from Kemin Industries, Renewable Energy Group and Archer Daniels Midland — to get their thoughts on Iowa’s biofuels and biomanufacturing landscape. The executives commonly said Iowa has multiple advantages suitable for a quickly growing bio-based chemical industry. They also said a “modest tax credit” could entice them to locate a plant in Iowa. “My hope is and my request, if I had to ask, is let’s get this done quickly. … Let’s own this and let’s do it quickly,” Authority Director Debi Durham said. “This may be a really good idea but so is having every third-grader being able to read at their grade level,” he said. This story was originally published by Donnelle Eller and Matthew Patane with The Des Moines Register. CBiRC’s regular office hours are 8:00 – 11:50 a.m. and 1:00 – 5:00 p.m., Monday – Friday. With the holiday season fast approaching, CBiRC has posted revised hours for Thanksgiving Break as well as the upcoming Winter Break during the months of December and January. Please click this link for dates and further details. Basil Nikolau, the center’s deputy director and Iowa State’s Frances M. Craig Professor of Biochemistry, Biophysics and Molecular Biology, said the center was built on a vision of biologists and biochemists working with engineers to solve common problems. The joint efforts have opened up new catalysts and technologies for the production of biorenewable chemicals. That has helped CBiRC quickly establish a legacy of innovation in research, technology-led entrepreneurship and education, said Brent Shanks, the center’s director and an Iowa State Anson Marston Distinguished Professor in Engineering. CBiRC faculty affiliate, Eve Syrkin Wurtele, was awarded the Woman of Innovation award for Research Innovation and Leadership by the Technology Association of Iowa (TAI) at their fifth annual DuPont Pioneer Iowa Women of Innovation event held on November 15, 2012 in Des Moines. This is the second consecutive year Dr. Wurtele was a finalist for this award. Nominations were submitted for women from communities across the state. Finalists represent a range of backgrounds: teachers, researchers, technologists, vice-presidents, presidents, CIOs, and CEOs, among other titles. They include scholarship winners and providers. Many nominees are nationally and internationally recognized through various publications, panels, and media outlets. They all represent excellence in innovation and leadership. Finalists also include high school, undergraduate and graduate students who have demonstrated extraordinary and unique achievements in technology. The TAI is the premier professional organization accelerating the success of Iowa’s technology industry and tech-based economy. Read the full story. Suitable catalysts for converting biomass to chemicals and fuels at low cost are not generally available today. A lot of petrochemical refining catalysts could do the job—but biomass refining conditions destroy them. Researchers have now found a way around this problem, by enhancing the stability and durability of the supports on which catalytic metals are dispersed. Read the December 3 Chemical & Engineering News article for more. 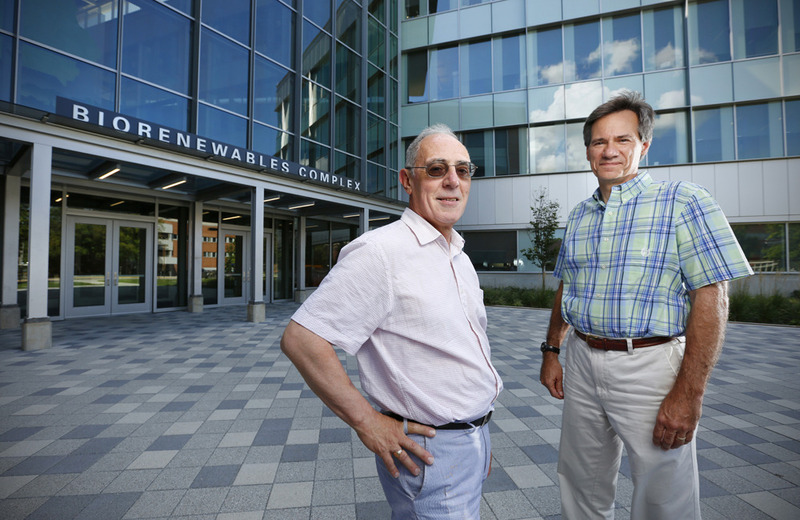 The National Science Foundation (NSF) has added $12 million and another three years of support to the NSF Engineering Research Center for Biorenewable Chemicals based at Iowa State University. The continuing support brings federal investment in the center up to $30.5 million over eight years. The center’s vision is to transform the industrial chemical industry from one based on petroleum to one based on biorenewable resources. Engineers and scientists are working together in new ways to invent catalysts that lead to industrial chemicals from biorenewable resources. Industrial partnerships are expanding. Startup companies are launching. Education partnerships are reaching teachers and students. And an international reputation is growing. They’re all steps the National Science Foundation (NSF) Engineering Research Center for Biorenewable Chemicals based at Iowa State University has made over its initial four years. That progress has led to the NSF augmenting the center (known as CBiRC, “See-burk”) with three additional years and $12 million. That brings the total federal investment in the center through the NSF’s Engineering Research Center program up to $30.5 million over eight years. The center can still be renewed for an additional two years, potentially bringing the NSF’s total support to 10 years and $34.9 million. After 10 years, CBiRC will transition to a self-supporting research center. In addition to the center’s base funding, it has so far garnered more than $14 million in other support. The center’s vision is to transform the industrial chemical industry – a $400 billion-a-year business in the United States – from one based on petroleum to one based on biorenewable resources. To do that, the center has asked researchers who study chemical or biological catalysts to start working together to develop new and sustainable technologies that produce the industrial chemicals used in everything from building materials to personal-care products. Basil Nikolau, the center’s deputy director and the Frances M. Craig Professor of Biochemistry, Biophysics and Molecular Biology at Iowa State, said the center’s interdisciplinary approach is attracting the attention of industry. When the center was established, it had six industrial partners. The center now has 27 (including Ashland, Chevron Phillips Chemical Co., DuPont, Grain Processing Corp., Michelin Americas Research Co., and POET) and is discussing additional partnerships. The center is also spinning off four companies in Iowa and three from partner institutions. The Iowa startups include Glucan Biorenewables LLC, originally established by Shanks; Peter Keeling, the center’s industrial collaboration and innovation consultant; and James Dumesic, the Steenbock Professor and Michel Boudart Professor of Chemical and Biological Engineering at the University of Wisconsin-Madison. Earlier this year, Nikolau, Keeling and Shivani Garg – a graduate student in biochemistry, biophysics and molecular biology – won an Innovation Corps grant from the NSF. The grant will support their work to develop bio-based chemical feedstocks. Joseph Noel – professor and director of the Jack H. Skirball Center for Chemical Biology and Proteomics at the Salk Institute for Biological Studies in La Jolla, Calif., and an investigator with the Howard Hughes Medical Institute based in Chevy Chase, Md. – said the program has identified pyrones as molecules for the center’s testbed research across disciplines. He said researchers have developed protein engineering techniques to improve the production of biorenewable molecules from sugar by common baker’s yeast. Chemical catalysts then convert the molecules to commodity chemicals. Noel said the research program has also successfully integrated high school and undergraduate students in its laboratories. Jackie Shanks, the Manley Hoppe Professor of Chemical and Biological Engineering at Iowa State, said researchers have used E. coli to produce carboxylic acids at the highest level reported to date. Carboxylic acids can be used to produce many industrial chemicals. She said researchers have also improved E. coli’s ability to resist the toxicity of the acids. Robert Davis, the Earnest Jackson Oglesby Professor of Chemical Engineering at the University of Virginia in Charlottesville, said researchers have made significant progress converting pyrones from research thrusts one and two to high-value chemicals. He said researchers have also developed technologies that convert carboxylic acids to alpha olefins that are used to make detergents and other chemicals. Brent Shanks said the center has established several education initiatives, including a graduate minor in biorenewable chemicals at Iowa State, research internships at the center’s European partners, a summer research program for undergraduates, research experiences and workshops for school teachers and a program that places graduate students in middle school science classrooms. All in all, Shanks said the center’s work is getting noticed and its researchers are taking calls from industry, technical conferences and the biorenewable research community.